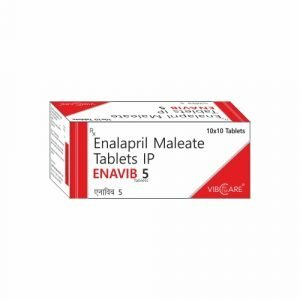 Enalapril is a prodrug that belongs to the angiotensin-converting enzyme (ACE) inhibitor class of medications. It is rapidly metabolized in the liver to enalaprilat following oral administration. Enalaprilat is a potent, competitive inhibitor of ACE, the enzyme responsible for the conversion of angiotensin I (ATI) to angiotensin II (ATII). ATII regulates blood pressure and is a key component of the renin-angiotensin-aldosterone system (RAAS). Enalapril may be used to treat essential or renovascular hypertension and symptomatic congestive heart failure. Overdosage may result in marked hypotension and stupor. Most common adverse effects include hypotension, headache, dizziness and fatigue. For the treatment of essential or renovascular hypertension and symptomatic congestive heart failure. It may be used alone or in combination with thiazide diuretics.